Activated charcoal is an extremely porous substance. It is so porous that a single gram of activated carbon has 500 square meters of surface area (which is one-tenth of an American football field). Charcoal is a black powder quite fine in texture made from wood and other natural materials. It is made by heating wood and natural materials in an airless environment. Charcoal employed for health conditions is generally “activated” to convert it into an extremely fine powder, which makes it more effective. Activated charcoal has the ability to chemically attach or absorb a variety of gases and particles, which makes this substance ideal for flushing out poisonous substances from the digestive tract. Our body does not absorb activated charcoal, and so it flushes out the toxic substances attached to activated charcoal out of our system through the feces. Activated charcoal is an extremely porous substance. It is so porous that a single gram of activated carbon has 500 square meters of surface area (which is one-tenth of an American football field). This porous surface area allows the chemicals and toxins to bind, thereby preventing the entry of unwanted substances in our body system and blood stream. If you have accidently ingested chemical substances, like pigments, odors, contaminants, or chlorine, and are feeling unwell, then the consumption of charcoal can help absorb such harmful chemicals present in your stomach and save you from falling ill.
A study by Michigan University has shown that 50 to 100 grams for adults and 10 to 25 grams for children can aid in healing the effects of poisoning. However, since certain poisons cannot be absorbed by activated charcoal, it is best advised to consult local poison control centers and other emergency services to find out whether or not to consume charcoal. It has been observed that some people take in charcoal from barbeques and fireplaces, believing that it is activated charcoal. However, any charcoal that is used as a cooking fuel, nowadays, is actually a compact mixture of coal or coke with different types of binders, and is therefore ineffective. 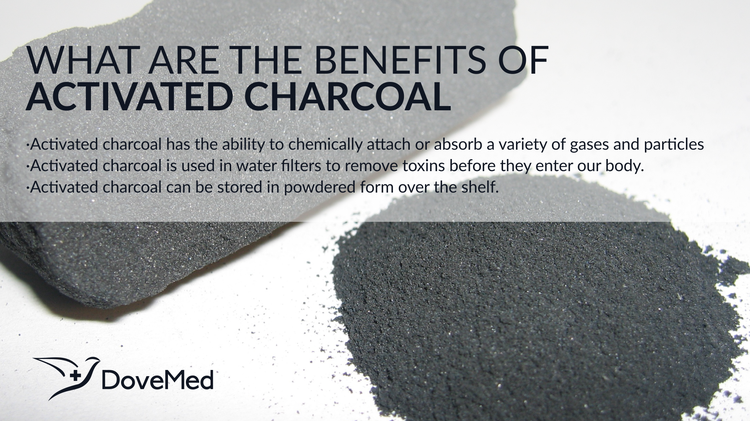 Another benefit of activated charcoal is that it is also used in water filters to remove toxins before they enter our body. However, it has to be noted that not all substances are absorbed and that chemical components, like fluoride, sodium, or nitrates, will remain unabsorbed. This means that an advanced water filter may be necessary in such cases. Overtime, the pores gets filled, making the charcoal less effective, meaning that it has to be either ‘recharged’ or ‘replaced.’ Hence, charcoal-based water filters are required to be changed every six months. Activated charcoal can be stored in powdered form over the shelf. Keep it on standby so that in case of an accidental ingestion of any poisonous household chemical substance, such as household cleaner, medicine overdose, sedatives, narcotics or even spoilt food, it may be used. Make the person consume this substance (under advice), and it will bring down the level of absorption by about 60%, which could save their life. However, never mix activated charcoal with other material substances, and always drink lots of water after consuming it, as it is an extremely absorbent substance. Dubinin, M. M., & Radushkevich, L. V. (1947). Equation of the characteristic curve of activated charcoal. Chem. Zentr, 1(1), 875. Levy, G. (1982). Gastrointestinal clearance of drugs with activated charcoal. Chyka, P. A., & Seger, D. (1997). Position statement: single-dose activated charcoal. American Academy of Clinical Toxicology; European Association of Poisons Centres and Clinical Toxicologists. Journal of toxicology. Clinical toxicology, 35(7), 721-741. Iqbal, M. J., & Ashiq, M. N. (2007). Adsorption of dyes from aqueous solutions on activated charcoal. Journal of Hazardous Materials, 139(1), 57-66. Mohan, S. V., & Karthikeyan, J. (1997). Removal of lignin and tannin colour from aqueous solution by adsorption onto activated charcoal. Environmental Pollution, 97(1), 183-187. Cooney, D. O. (1980). Activated charcoal: antidotal and other medical uses (Vol. 9). Marcel Dekker Incorporated.